Among the numerous games that online casinos tend to offer, you’ll find many attractive options such as slots, roulette, blackjack, baccarat, craps, and so on. However, one of the main draws in the bigger online casinos has got to be their poker tables – that offer up games of Texas Hold Em, and tend to pull in a fair sized crowd. If you’re trying to choose between playing poker or one of the many other casino games that are out there, it all boils down to one thing in particular: Odds. Poker in online casinos stands out from all their other games because it is one of the few games where you’re not playing against the casino. Instead, you’re playing against all the other players on the table. Granted, the casino is taking a piece of the winnings, but at the end of the day that still means that your odds of winning or losing aren’t going to be skewed. 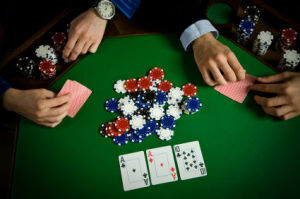 With other casino games, the odds of winning are always skewed in the favor of the casino. That is where the phrase ‘the house always wins’ comes from, and it is because although you might have a 49.5% chance of winning, the houses 50.5% chance is still that little bit better that in the long run they’ll end up making a profit. But with poker, there is none of that. Instead, poker is a game where it’s all about you, your cards, and the other players sitting at the table. Before the cards of dealt, each player stands an equal chance of taking the hand, and skill is a factor as much as luck is. For many casino-goers, this has quite a lot of appeal. Rather than playing by skewed odds, this way the casino will make money at the end but it won’t affect your likelihood of winning or losing. It may all sounds a little bit complicated, but the bottom line is: If you like poker and you enjoy the fact that you’re not going to be playing against the house – go ahead. Check out http://poker.paddypower.com/ and see the options that are available as well as the bonuses that they’re offering up too. If you play your cards right, you could not only enjoy a few great games of poker – but you may even be able to cash in one some of those neat bonuses too.